A picturesque terrain rich in natural resources, the Sinai peninsula has nevertheless been the victim of decades of state neglect. “We are deprived of clean running water, a basic human right. And we have to travel long distances or dig water wells to access this vital need,” Fathy El-Nahal, a local Bedouin told Ahram Online, from his Rafah quarters overlooking the Gaza border. Despite ambitious governmental development projects, proposed since Egypt regained sovereignty over Sinai in 1981, to date little has been accomplished. Instead the azure coastline became the focus of state tourism-inclined investments, but devoid of a strong infrastructure to ensure a decent standard of living for Sinai residents. Central and northern Sinai, where a third of the area’s 600,000 residents live, were patently overlooked in the development equation. Programmes in northern and central Sinai initiated in the mid 1980s, including land reclamation projects and the Al-Sheikh Gaber Al-Sabah Canal extension in 1997, which started providing irrigation water to the parched desert land, remain incomplete. "The main problem lies in central and northern Sinai, which remain primitive owing to Mubarak’s era of neglect,” explained Dr Said Sadek of the American University in Cairo. Essential amenities such as clean water, quality healthcare and education, adequate transportation and infrastructure are sorely lacking. International rights group Human Rights Watch (HRW) publically denounced the injustice Sinai's Bedouins are subjected to, acknowledging the socio-economic rights they are deprived of in contrast to fellow Egyptians. Such social inequity has led some, according to Youssef, a taxi driver in the town of Al-Arish, to seek services from nearby Israel, which many Egyptians deem as the enemy. Others have chosen to migrate to escape such adversity; local Bedouin activist Siad Abdel Hedi from the Sawairka tribe described how his brother moved to London, an option he too is contemplating. “After all this hardship I have to prove that I am a good citizen and avoid criminal activity. Where is the state? Why has it left my people in poverty?” he asked, expressing his sympathy towards his deprived fellow nationals whilst playing with his iPad. The Bedouin activist confessed that he, unlike many, is fortunate given his family's inherited wealth. Others have no choice and are forced to smuggle goods through the clandestine tunnels or to be bought by intelligence agencies like the CIA, Mossad, and Hamas. Disparate citizenship rights are another pivotal issue causing grave discontent. A state report published in 2010 suggests a quarter of all Sinai's population do not have a national ID card. “Without official documents proving Egyptian nationality you cannot register with an NGO to access services. Often children can't register for injections against diseases,” stated Hanan Moqaibid, a female Bedouin activist from North Sinai's Bayadeiya tribe. To make matters worse, Bedouins are also not allowed to own land, serve in the army or profit from local tourism. The issue of land ownership in Sinai contributes to the population’s frustration since no local can own the land their family has resided in for centuries. Today, southern Sinai generates Egypt's highest tourism revenues and is a notable source of foreign currency. Yet such benefits do not trickle down to the peninsula’s indigenous people. Further substantiating the gravity of such inequity is illustrated by the fact that tourism accounts for more than 11 per cent of Egypt's GDP, generating around $9 billion in 2011 ($12 billion in 2010). “Severe concentration of economic power in the tourism domain marginalised some of the most influential tribes,” Egyptian author Tarek Osman argued in his book ‘Egypt on the Brink’. Broader multi-faceted growth in the peninsula was hampered by a lack of good roads, modern housing, residential and commercial services, and transportation options. This is exemplified by northern Sinai’s unfinished airport in Ras Sidr, as well as the Al-Salam Canal project which could ensure land reclamation, supply fresh water to northern Sinai and attract non-agricultural investors. Furthermore, the 225-kilometre railroad, linking Ismailia, Al-Arish and Rafah remains incomplete and the equipment and tracks have been stolen, Abdallah Kandil, head of the chamber of commerce in northern Sinai told officials. Moreover, economic development in Sinai was also influenced by national legalisation preventing individuals and corporations from owning land, limited to right-to-use contracts of up to 99 years. In addition property rights also prohibited Sinai companies from being listed on the stock exchange. Despite apparent attempts by the government to instigate development in the peninsula after the revolution, solid progress is yet to be seen. The creation of the national authority for the development of the Sinai peninsula (SDA) as well as draft legislation to permit land ownership and to manage the listing of Sinai-based companies on the stock exchange are still pending approval in the People's Assembly. 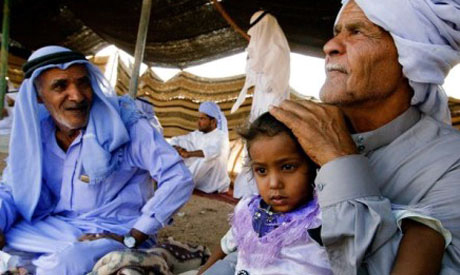 Government policy toward the native Bedouins is also cited as a hindrance to development; as the government ignored the cultural mentality of northern Sinai’s indigenous population. Correspondingly, both Adel Rady, former head of the Tourism Development Authority and Bedouin campaigner Siad, emphasise the importance of considering tribal conventions in future development projects. However great the potential for development in Sinai, the obstacles are substantial, including a small labour force and above all a government in Cairo faced with a national economic crisis as well as a legacy of injustice. One solution to the labour issue suggested by agricultural experts is to offer jobs in government-backed agriculture projects to those with a farming background. Another option involves former prime minister Ganzouri's proposal to relocate 4.5 million people to Sinai in the near future. In an attempt to address the socio-economic and security matters the ex-premier granted amnesty to some jailed extremists and ordered the revival of development projects in the region. Other feasible solutions proposed by experts and locals to address socio-economic problems in the picturesque rugged peninsula relate primarily to security and economic policy. Strong economic policy, fostering socio-economic and cultural development that will provide citizenship, property and minority rights and employment, along with increased cooperation, cultural understanding and respect are also needed. “We want citizenship and land rights; equality for all Egyptians,” declared Hussein Galbana, 25 January Movement's Sinai representative. Such enduring inequity is bewildering given the endless unexplored potential in this famed region in terms of agro business, religious and eco-tourism, mineral extraction, bio-fuels and Red Sea fish production; as well as ambitious notions of creating an eco-friendly hub. Thus, the question remains, why have Sinai people been neglected for decades? “Since 1968 Sinai people have been viewed by the government as traitors. The Mubarak regime didn't want to upset Israel so it kept Sinai under developed; we are being punished,” exclaimed Barhoom, an opinion commonly expressed by locals. “The former regime believed development will create a fallout with Israel; so Mubarak betrayed the Bedouins,” said Galbana. Whatever the reasons behind such injustice, the compelling words of human rights activist Dr Saad Eddin Ibrahim bear heavily on all Egyptians. Perturbing byproducts of state neglect; which include a rise in extremism, exemplified by the recent murder of 16 Egyptian border guards near Rafah, and growth in the illicit tunnel economy, strengthen Eddin Ibrahim's recommendation. It depends on the local ihabitants and the expulsion of Iran's poppet Hamas gang from Gaza. Gaza is part of Egypt since King Tohotmus with some Pals refugees. We can not afford the eastern front to a gang of drug dealers. Get them out now. It is good, fair, professional report about the forgotten people. They are reminent of Napolion French army that was defeated ccenturies ago.They are honest and simple people.